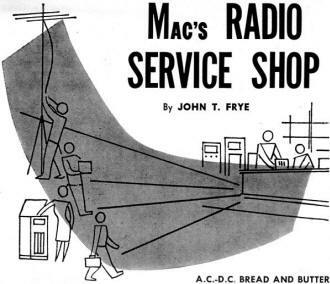 This installment of Mac's Radio Service Shop could stand alone as a chapter in a troubleshooting manual for vacuum tube radios. 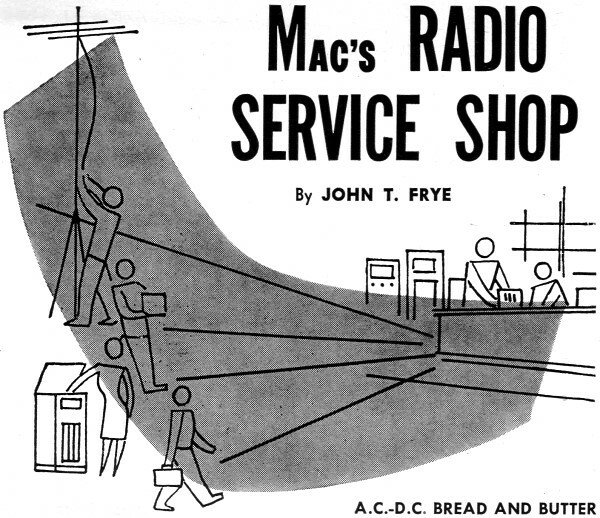 John Frye's (or a trusty consultant's) knowledge of circuit operation is abundantly clear here. Recall that Mr. Frye later authored the Carl & Jerry teenage techno-sleuth series in the next decade. A couple things stood out to me. The first is the heretofore unfamiliar phrase "play hob with," which means to cause trouble for. The second is mention of a metal tuning dial indicator needle making contact with a part of the metal faceplate and thereby affecting the tuning of the radio. What that means is the needle had some level of voltage on it that could short to the chassis. It was not unusual to have very high voltages on the dial and button shafts of user-accessible controls, with only a plastic or phenolic knob or button separating the user from a potentially lethal shock. Safety grounds were not part of the supply line cord, further increasing the danger. In fact, I am currently restoring a 1970s vintage record turntable that has a 2-wire line cord and the electronics are mounted to the metal chassis that serves as the base of the mechanical assembly. The input transformer is isolated from the chassis with rubber grommets around the mounting screws. They are in good condition, but out of an abundance of caution I am installing a 3-wire power cord and an inline fuse. Barney, returning from picking up the mail at the post office, was so intent upon looking at the small object he was holding up toward the sky that he walked straight into the screen door of the service shop. The squeaking protest of the stretched wire made Mac look up from the chassis on which he was working. "Could it be that you need glasses - or maybe a whole new head?" he inquired solicitously. "Neither," Barney promptly retorted. "I was merely trying to look at these transparencies that just came back. They are all shots of the fall leaves that Margie and I took on our trip to the southern part of the state a few days ago." Mac picked up the box of slides and held some of them toward the light. "Say!" he exclaimed, "you've got some beauties here. I really get wound up about the show Old Mother Nature puts on in October in this part of the country, and these color shots of yours really do justice to the autumn foliage." "Why all these kind words?" Barney asked suspiciously as he looked around. "Oh I get it now," he said as his eye lighted on a great stack of small a.c.-d.c. sets piled on the receiving bench. "You're trying to butter me into wading through that bunch of cigar-boxes." "My boy," Mac said solemnly, "sit yourself down and let me tell you some of the facts of life. Those 'cigar boxes' as you disparagingly call them are quite likely to be a major part of your bread and butter for some time to come. Have you noticed that while the number of consoles we get is less and less since TV started in this fringe area, the number of these a.c-d.c. sets seems to be on the increase?" "Now that you mention it, I have," Barney assented. "How come?" 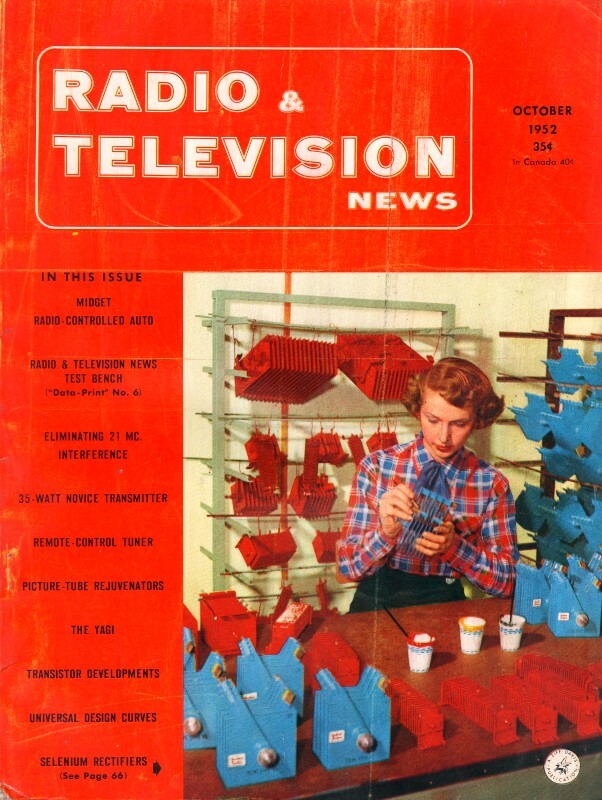 "The television receiver has almost entirely thrust the console radio out of the place of honor in the living room," Mac explained; "but the little radio is still holding its own in the kitchen, basement, bedroom, or any other location in the house where a person may want to listen to music, news, soap opera, or what-have-you while going ahead with work, reading, or other similar activity. That is why it looks as though the small set will be the last to go under before the onslaught of television - if it ever goes under. I've been glancing back through our records, and I find that we are actually getting more of these little fellows to service now than we did before TV started. Since a very high percentage of the radio work we do is going to be on these sets, I thought it might be a good idea if we sort of overhauled our a.c.-d.c. service procedure and made sure our technique in handling these sets is the best possible." "I know all there is to know about working on those sets," Barney stated flatly. "I'm sure that you do," Mac said meekly. "If there is one kind of set that the technician should know like the back of his hand, it is the five or six tube a.c.-d.c. receiver; but I am getting kind of old and in my dotage and do not remember things as well as you young fellers do; so if you don't mind, we'll just run over a few points about working on them for my benefit. After being in this game for a quarter of a century, the one thing I am sure of is that you never know so much about service work but that you can learn something new - present company excepted, of course." A quick flush spread over Barney's, freckled face. "Okay," he mumbled. "I had that coming - and I got it!" "I have noticed," Mac went ahead quickly, "that when a set comes in that quite likely has a burned out tube, you try to locate the tube and replace it without removing the set from the cabinet. In the future, I want the set removed in every case. Doing so usually will actually save time. Trying to remove the tubes with the set still in the cabinet often results in breaking loose the leads of the dangling loop antenna. When you try to remove the tubes in the cramped and awkward quarters inside the cabinet, often a tube will suddenly come loose and slip from your fingers like a pinched watermelon seed and sail halfway across the shop. If it is not ruined on the spot, the jarring will likely cause it to go out in the not very distant future. "Another reason for taking the set out of the cabinet is that it gives you a chance to look it over for other trouble and to clean the dial glass - a small item that looms surprisingly large in the eyes of the ladies. With the chassis out in the open, a single glance is all that is needed to spot a frayed dial cord that needs replacing or a slack tension spring that is getting ready to cause trouble. The same quick look will reveal cracks in the speaker cone that require cementing. Then you can flip the chassis over and take a look for charred resistors, especially in the vicinity of the rectifier socket. While you are at it, notice if a lightning surge may have blown apart the line bypass condenser. Look at the dial lamp. If the filament is open, replace the lamp before turning on the set; and in that case a good first guess on the tube with an open filament is the rectifier." "I know that you mean that quite likely the portion of the rectifier filament that the dial lamp bridges has gone out and let the full current pass through the dial lamp and burn it out," Barney interrupted; "but I do not see why it is important to replace the dial lamp right away." "In the first place, I never like to subject that tapped portion of the rectifier filament to an overload, even for a short while; and that is what it will get if the dial lamp is not replaced. Secondly, a seasoned technician always watches that dial lamp while the set is warming up. Since the rectified plate current as well as the filament current flows through it, the brilliance of the lamp gives you a rough but useful indication of any excessive current drawn from the rectifier. Many a time I have seen a dial lamp blooming in time to snap off the set and save a rectifier. "After the set has warmed up for a few minutes, align it. You can improve the alignment in almost every case. The transformers used in the i.f. stages are usually not the most expensive, and they are subjected to very high temperatures inside the small cabinets. The alternate heating and cooling tends to change the resonant frequencies of the windings. I kept a record of all the a.c.-d.c. sets serviced for a week one time, and I found that in nine cases out of ten I could effect at least a 20% increase in output measured across the voice coil simply by realigning the i.f.'s. While you are adjusting the transformers, notice how sharply they resonate. Of course, the winding across the diode load will tune broader than the others; but the remaining three should peak up quite sharply and definitely. If they do not, something is wrong. A weak i.f. tube, shorted turns in one of the windings, a high resistance in the winding, or a defective trimmer condenser may be at fault. "If the set oscillates when you try to bring it into alignment, that is another headache; but never say to yourself 'I guess it was just made that way' and solve the problem by throwing it out of alignment until it stops oscillating. Look for open plate or screen bypasses. See if the output section of the filter condenser - which doubles in brass as a plate bypass in many of the inexpensive sets - has not deteriorated. Change the i.f. tube. Check the a.v.c. bypass condensers. Make sure the plate and grid leads are dressed away from each other. See to it that the metal shell of the i.f. tube is properly grounded through the socket connection. If none of these causes is present, try changing the i.f. transformer. Often the heat causes the top i.f. winding to slide down toward the bottom winding and cause over-coupling." "Hold up, now! Changing an i.f. is quite a little job just to see if it could be the trouble." "Not the way I do it. Simply cut loose the leads from the transformer to the plate and to the grid or diode. Then tack the connections from the replacement transformer to these points and also to "B-plus" and to the a.v.c. bus with the soldering iron. Then use a short clipped lead to ground the shield can to the chassis. This outboard transformer can then be brought into alignment, and it can be quickly seen if the trouble is corrected. If so, the transformer can be installed permanently; if not, the leads of the transformer in the set can be reconnected in a matter of seconds." "Say," Barney broke in, "when you're aligning the front end of a set and you can't make the oscillator track both with the dial and the r.f. stage, which one should you choose?" "Well, if a choice has to be made, I'd say make it track with the r.f. stage, for that would give you the best reception," Mac replied; "but usually you can shift the i.f. or bend the plates of one or the other or both sections of the tuning condenser so as to arrive at a happy condition in which the oscillator will track with both the dial markings and the r.f. stage. Don't be afraid to bend those plates. That's why they are slotted. Use the trimmers to line up the set at the high frequency end of the band and then bend the plates to do the same thing at around 600 kilocycles." "How about sets that are just low on pep?" "Try substituting tubes, even though the ones in the set test good. This is especially important with rectifier and mixer tubes, for a tube tester will often mislead you on these. A bad i.f. transformer is often a cause, and the best test is to substitute a new one as I mentioned awhile ago. Reversed antenna leads to a loop antenna will sometimes play hob with the sensitivity, too. Of course, when you are aligning the set, you should note if the gain from the mixer grid to the speaker is normal or not. That helps a lot in knowing where to start looking for the trouble. "Hum is another common trouble with these little sets. Usually it is caused by weak or open filter condensers, but that is not always the case. Heater-to-cathode leakage will often produce hum, especially in the output tube because the filament at this point is considerably above ground. Changing tubes, of course, corrects it. A hum that is only heard when a station is tuned in and one that is loudest when the received signal is strongest is likely to be caused by an open line bypass condenser. It will go away if this condenser across the a.c. line is bridged with a good unit. On some sets the tuning condenser is isolated from the chassis by rubber grommets around the mounting bolts. If one of these grommets is cut through or slips out of position so that the tuning condenser can short to the chassis, you get an exceptionally loud hum. Recently a receiver of this sort gave me a hard time because it developed a hum only at certain points on the dial. The giveaway clue was the fact that while the tuning condenser was being rotated a scratching sound was heard just before the hum would start. I found the metal pointer on the end of the tuning condenser shaft was shorting to the grounded metal foil on the face of the dial at certain spots. Bending the pointer away from the foil cleared the trouble. "While looking for strange noises, always jar the tubes lightly with that little rubber tapper we use. These miniature tubes are bad ones for developing internal shorts, and sometimes you can spot one developing by noticing a rattling sound or change in volume when the tube is tapped. Especially notice if the rectifier makes a noise when tapped. 35Z5's, 35Y4's, and the like often become noisy and should be replaced; otherwise, the set will make a scratching noise every time it is jarred, even by a loud sound from the speaker. "Finally, after the set has been on for some little time, check the bias voltage on the output tube. If it is low, cut the coupling condenser loose from the grill and see if this makes any difference. If it does, the coupling condenser is doubtless leaky, but you can double-check by seeing if the end cut loose does not display a positive voltage. If the grid of the output tube remains positive with respect to ground after the coupling condenser has been disconnected, you probably have a tube afflicted with secondary emission. Try another tube and see if the condition does not disappear. If the bias is developed across a resistor in the cathode circuit, perhaps the resistor has changed value or the electrolytic bypass across it may be partially shorted. The main point is that you should not let the set leave the shop until the bias voltage of the output tube is within ten per-cent of its rated value. A set cannot sound good unless this voltage is correct." "You know," Barney reflected, "I am beginning to think I may have been a little hasty in saying that I knew all there was to know about a.c.-d.c. sets. Two or three of those points you made kind of brought to mind things I did know once but had forgotten. Of course I did know about them." "Of course," Mac agreed with an enigmatic smile.